A Reciprocating Pump is a hydraulic device used to transfer liquid from one place to another. In hydraulic engineering, various types of Reciprocating Pump are used. Here in this post, I will like to share information on the reciprocating pump with you. 01) A Cylinder in which Piston works. The movement of Piston is obtained by a Connecting Rod, which connects the Piston and the Rotating Crank. 02) A Suction Pipe, connecting the source of Water and the Cylinder. 03) A Delivery Pipe, into which the Water is discharged from the Cylinder. 04) A Suction Valve, which admits the flow from the Suction Pipe into the Cylinder. 05) A Delivery Valve, which admits the flow from the Cylinder into the Delivery Pipe. During the Suction Stroke, the Piston moves from Zero to 180 Degree (which means towards right direction). Thus creating Vacuum in the Cylinder. This Vacuum causes the Suction Valve to open and Water enters the Cylinder. During Delivery Stroke, the Piston moves from 180 Degree to 360 Degree (which means towards left direction). Hence it increases pressure in the Cylinder. 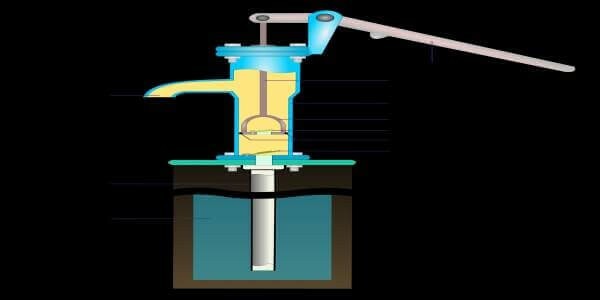 Due to increase in Pressure, causes the Suction Valve to close and Delivery Valve to open, and Water is forced into the Delivery Pipe. A Hydraulic Reciprocating Pump is also called a Positive Displacement Pump. As it discharges a definite quantity of Liquid during the Displacement of its Piston. This is why a Hydraulic Reciprocating Pump is ideally suitable for Grouting Operations in Dam Foundation. To obtain a uniform Discharge from Reciprocating Pump, the Air Vessels are fitted to the Suction and Delivery Pipe, close to the Cylinder of the Pump. An Air Vessel is a Cast Iron closed chamber, having an opening at its base, through which the water flows into the Vessel or from the Vessel. The Vessel is filled with Compressed Air.